View of the Pyramid block from the northeast (along Columbus). The proposed 555 Washington Tower is to the left of the Pyramid. Early in 2010, San Francisco witnessed another skirmish over density. 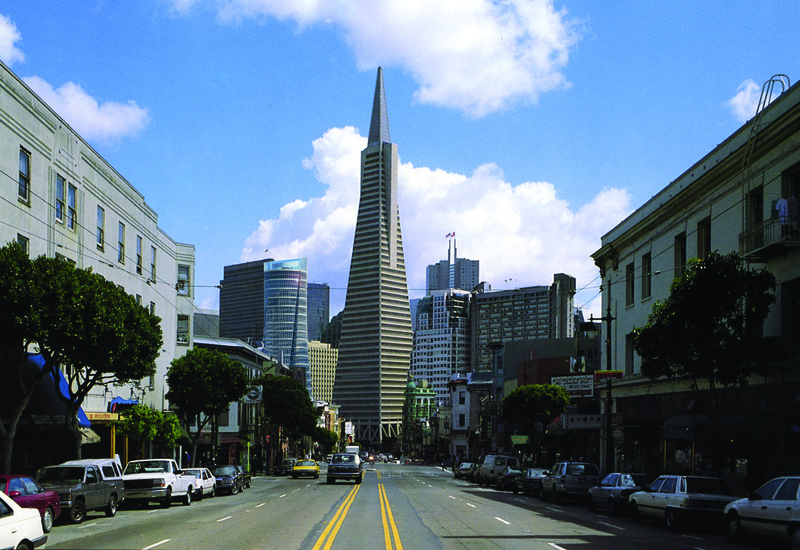 This one involved a proposal to replace an existing building on the same block as the 48-story, 850-foot-high Transamerica Pyramid (1972). Located at the corner of Sansome and Washington Streets, along the north edge of the Financial District, the proposed 38-story tower considerably exceeded the maximum-height “wall” of 200 feet called for by the City’s current zoning regulations along the district’s north edge. I agree with Puri. When you remove the current 200-foot height limit along the north edge of the Financial District, what’s at stake is the district that adjoins it. The Downtown Plan didn’t set the height limit to preclude residential development, but to establish a clear boundary. While 555 Washington is 420 feet shorter than the Pyramid, it is 220 feet taller than it should be. Located right at the edge, the Pyramid—completed 13 years before the Downtown Plan—sought to shift the center of gravity of the Financial District north from Market Street, away from transit. The Downtown Plan rejected this, emphasizing the Market-and-Mission corridor as the core of high-density redevelopment in downtown San Francisco. That emphasis was reiterated more recently by the Transbay Terminal Area Plan, which calls for very tall buildings in the corridor. Nevius is also privileging a “progressive” future against a stagnant present. The opponents of 555 Washington are portrayed as nostalgic, elitist, and out of touch. Although he opposed the tower and called for a new Downtown Plan, the San Francisco Chronicle urban design writer, John King, has expressed a similar view of “reflexive” preservationists. So has the San Francisco Urban Research Association (SPUR), an influential urban policy group in the city. A question that these arguments raise is whether modern life has left us ill-equipped to consider density in relation to the scale and character of a place. Have we actually been blinded by the assumptions of modernity to disregard what surrounds us and opt instead for “progress” that speaks to abstract values rather than to the actual experience of a city as a series of places? Reading an interview of the philosopher Ivan Illich3, I came across a reference to Leopold Kohr (1909–1994), a political theorist best known for the phrase, “Small is beautiful.” In a talk that Illich gave at Yale University in October 19944, he noted that Kohr advocated for proportionality rather than smallness. Reading Illich on Kohr’s main themes, I saw his relevance to the question. Kohr would say that bicycling is ideally appropriate for one living in a certain place. This statement reveals that “certain,” as used here, is as distant from “certainty” as “appropriate” is from “efficient.” “Certain” challenges one to think about the specific meaning that fits, while “appropriate” guides one to knowledge of the Good. Taking “appropriate” and a “certain place” together allows Kohr to see the human social condition as that ever unique and boundary-making limit within which each community can engage in discussion about what ought to be allowed and what ought to be excluded. “Plato would have known what Kohr was talking about” Illich said. “In his treatise on statecraft he remarks that the bad politician confuses measurement with proportionality.” He goes on to note how words like ethos, paideia, and tonos, which implied “proportion as a guiding idea, as the condition for finding one’s basic stance,” were either lost or took on new meanings during the period of the Enlightenment. This disappearance has hardly been recognized in cultural history. The correspondence between up and down, right and left, macro and micro, was acknowledged intellectually, sense perception confirming it, until the end of the 17th century. Proportion was also a lodestar for the experience of one’s body, of the other, and of gendered relations. Space was simply understood as a familiar cosmos. Cosmos meant that order of relationships in which things are originally placed. For this relatedness—this tension or inclination of things, one to another, their tonos—we no longer have a word. Tonos was silenced in the course of Enlightenment progress as a victim of the desire to quantify justice. Therefore we face a delicate task: to retrieve something like a lost ear, an abandoned sensibility. An ethics of value—with its misplaced concreteness—allowed one to speak of human problems. If people had problems, it no longer made sense to speak of human choice. People could demand solutions. To find them, values could be shifted and prioritized, manipulated and maximized. Not only the language but the very modes of thinking found in mathematics could norm the realm of human relationships. Algorithms “purified” value by filtering out appropriateness. Modernity, that child of the Enlightenment, came with a price. The prestige of science meant that scientism entered the rest of life. How we think and talk about density today, and how we try to regulate it, is symptomatic of this. Much urban development is a diktat of abstract values, higher density for its own sake, which refuses to see the existing cityscape as being a “good” in itself. “In matters of the heart, we acknowledge an abiding uncertainty,” said the writer Siri Hustvedt. Ordinary people express their desires, and desires are ambiguous, she went on to note.6 The East German activist Bärbel Bohley, describing her disappointment in German reunification, said, “We wanted justice and we gained the rule of law. Our society was never speechless or dumb. That was only in public. Problems were discussed around every kitchen table—much more than they are today.”7 Leaving room for ambiguity is hard when density is reduced to an abstraction. Discussing it around the kitchen table is hard when ordinary people are viewed by experts as an obstacle to progress. Perhaps we could say, with Illich and Kohr, that modernity itself has left us without sufficient specificity about the cities we inhabit to discuss their density meaningfully. Not every planner is proportion-blind, as Kohr and Illich might put it, but the justification for density in urban settings often takes leave of nuance, cutting itself off from the qualities of place that are reflected in the existing urban fabric. The question to ask of density is, “What will it actually contribute to this place—this site, block, neighborhood, or district—in terms of livability, urbanity, and sustainability?” To answer it, we need to restore a “common sense” about proportionality and appropriateness, so that the subject of density regains moorings to actual settings and to those who live and work in them. This is not to say that the existing fabric should simply be replicated at its current scale. That’s too often the argument on the other side: Leave it as it is! Kohr and Illich are not making that argument, but suggesting that there is a potential common ground between the two poles of applying abstract regional density targets, on the one hand, and resisting urban redevelopment, on the other. However, there is also massive distrust across that divide. On both sides, bridging the gap means finding a shared language about the evolution of our cities that honors the heart as well as the head, restoring tonos and common sense—temperament in its older sense. The ends are worth these means. Without substantive, ongoing, community-based debates about our cities as a series of real places, we’re not as smart about their development as we need to be. What’s at stake is our cities’ urbanity—now and in the future. Behind urbanity are the place-specifics of proportionality and appropriateness. And behind them are the people who care about these places, sometimes with the irrational ardor of lovers. Planners should be among them. John Parman, “Urbanity, not just Density,” Architect’s Newspaper, California edition, March 31, 2010, page 22. C.W. Nevius, “Tower new front line in fight for S.F.’s future,” San Francisco Chronicle, February 13, 2010. The quotes from Nevius that follow are from this article. David Cayley, “Introduction,” Ivan Illich in Conversation, Anansi, 2007, pages 15–16. Ivan Illich, The Wisdom of Leopold Kohr, 14th Annual E.F. Schumacher Lecture, Yale University, October 1994, E.F. Schumacher Society, 1996. The other quotes are from the lecture, which was republished by the Schumacher Society as a pamphlet. Words like proportionality are being used here in their pre-Enlightenment sense. Siri Hustvedt, “A Plea for Eros,” Yonder, Henry Holt, 1998, page 90. The first sentence is from “Bärbel Bohley,” The Economist, September 25, 2010, US edition, page 107; the rest from Quentin Peel, “Bärbel Bohley, East German dissident, 1945–2010,” Financial Times, 25–26 September 2010, US edition, page 5. John Parman writes for Arcade, arcCA, Architect’s Newspaper and other publications, and co-founded and published the journal Design Book Review (1983–1999). He lives in Berkeley, CA.